Champion De Arment Anvil Logo. 01/15/2019: Fixed bitrot in company history link. 02/03/2016: Added Channellock 436 Diagonal Cutters. 02/02/2016: Reorganized Table of Contents. 06/23/2011: Added a Champion De Arment 3/0 Ballpeen Hammer. 05/19/2011: Added Channellock 317-1/2 Needlenose Pliers. 05/09/2011: Added Channellock 516 Combination Pliers. 03/19/2011: Fixed link to company history. 08/21/2010: Added a Champion De Arment 10 Inch Pipe Wrench. 09/07/2009: Added Channellock 3048-1/2 Lineman's Pliers. 01/04/2009: Added Channellock No. 447 Diagonal Cutters. 08/10/2008: Added Channellock No. 548 Slip-Joint Combination Pliers. 03/09/2008: Added Channellock No. 420 Tongue-and-Groove Pliers. 10/30/2007: Added Channellock Early No. 410 Tongue-and-Groove Pliers. 04/18/2007: Added Channellock No. 426 Tongue-and-Groove Pliers. 03/07/2007: Added a Champion De Arment No. 6 Ballpeen Hammer. 03/06/2007: Moved to separate page, added Channellock No. 420 Pliers. 02/22/2007: Added Champion De Arment No. 307 Battery Pliers. 02/08/2007: Added Channellock No. 460 Pliers. 02/01/2007: Added Channellock No. 420 Pliers. 01/25/2007: Added Channellock No. 440 Pliers. 01/10/2007: Added a Champion De Arment 3/0 Ballpeen Hammer. 12/16/2006: Added Channellock 326 Needlenose Pliers. 12/02/2006: Added Channellock 407 Pliers and Channellock 410 Pliers. 07/20/2006: Added Channellock 437 Cutters. 07/14/2006: Added No. 427 Pliers. The Champion De Arment Tool Company became most famous for their Channellock plier design, described by patent #1,950,362 and arguably one of the most important tool patents of the 20th century. The company later changed its name to Channellock, Inc., but we'll use the older name here. Champion De Arment is actually one of the older American tool makers in continuous operation, with original roots going back to 1886 when its founder, George B. De Arment, operated a blacksmith shop. The company maintains a web site with an interesting page on the Company History [External Link], and readers are encouraged to check there for further information. The advertisement at the left was published on page 39 of the October, 1908 edition of The American Blacksmith. The ad shows the Champion "Our Pride" hoof shears, and notes the ball bearing joint and interchangeable knives. Note also the small "Pat. applied for" notation. The patent for the hoof shears was issued to G.B. De Arment as 908,969 in 1909. It's also interesting that the ad shows an "Electric Sharpening Hammer" (an electric hammer?) apparently intended for sharpening calks. This shows that the company was offering at least some types of hammers by 1908, significantly before the 1914 date given in the official company history. Champion registered the trademark "Champion De Arment" with the first use listed as January 15, 1925. The "Channellock" trademark was registered with the first use listed as May 1, 1932. Champion De Arment tools are not known to be marked with any date codes, so estimates of manufacturing dates must be made on the basis of markings, patents, or other factors. Hammer Production. Hammers were first produced in 1914. Champion De Arment. The Champion De Arment name was first used in 1925. Early Channellock Patent. Tongue-and-Groove pliers made with the original patented design were produced from 1932 until the early 1950s. Middle Channellock Patents. 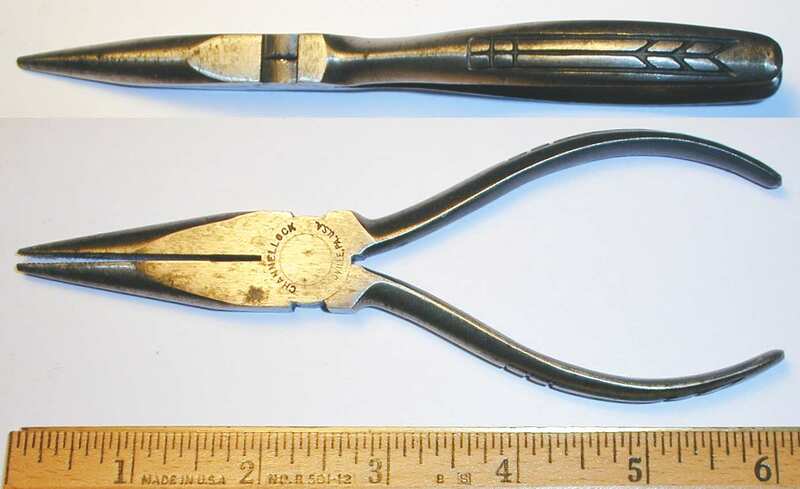 Pliers in the second-generation design were produced from the early 1950s onward. Channellock Name. Tools marked with the Channellock name instead of Champion De Arment were made in 1963 or later. Late Channellock Patent. Pliers marked with patent #3,192,805 were produced from 1965 onward. Rivet Construction. In 1982 Channellock filed a patent for the use of a rivet for tongue-and-groove pliers, replacing the bolt and nut used previously. Blue Handles. Pliers were being supplied with blue plastic handgrips by the mid 1980s (or possibly earlier). Photographs and observations of particular tools are based on items in the Alloy Artifacts Collection. Channellock maintains a web site with an informative page on the Company History [External Link], and readers are encouraged to check there for more information on this company. Product information was obtained from several Champion De Arment and Channellock catalogs, as summarized in the table below. No. 353 1953 Illustration shows advantages of second-generation "Channellock" patents. No. 68 1968? Channellock, Inc. company name. Blue grip handles available. According to the company's history page, Champion De Arment first started making hammers in 1914. Champion offered a wide selection of ballpeen hammers, with head weights ranging from 3 ounces up to 40 ounces. Ballpeen hammer sizes are commonly specified by a number indicating the weight of the head without the handle. In this number system a No. 0 hammer head weighs approximately 16 ounces, but since hammers with lighter heads are often needed, the system was extended to include Nos. 00, 000, and so on, up six zeros. Marking a long string of zeros could become a bit cumbersome, so an alternate notation is commonly used, with a number followed by a "/0" to indicate the number of zeros. For example, 2/0 indicates No. 00, 3/0 is No. 000, and so on. But to add confusion, the slash separator is sometimes omitted, so that a "3/0" size may be marked "30". The Champion ballpeen hammers are summarized in the table at the left, as listed in a 1933 Ducommun catalog. 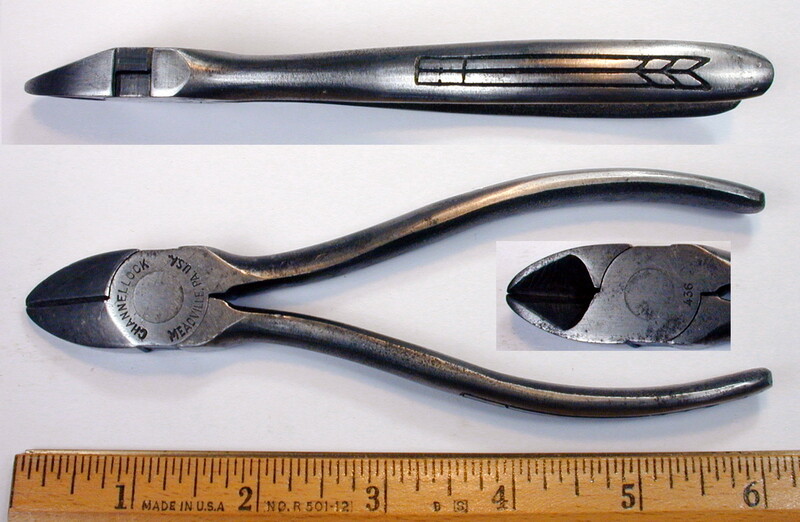 The next two figures show examples of Champion ballpeen hammers in the 3/0 or 8 ounce size. Fig. 1. Champion De Arment 3/0 8 Ounce Ballpeen Hammer, with Insets for Side View and Marking Detail. Fig. 1 shows a Champion 3/0 8 ounce ballpeen hammer, stamped with "Champion De Arment Tool Co." and an anvil logo on the face. The overall length is 13.2 inches, and the head is 3.3 inches long. Fig. 2. Champion De Arment 3/0 8 Ounce Ballpeen Hammer, with Inset for Marking Detail. Fig. 2 shows a Champion 3/0 8 ounce ballpeen hammer, marked on the face with "Champion De Arment Tool Co." and an anvil logo. The overall length is 13.0 inches, and the head is 3.2 inches long. Fig. 3. Champion De Arment No. 6 40 Ounce Ballpeen Hammer, with Insets for Marking Detail. A much larger Champion hammer is shown in Fig. 3, a Champion No. 6 40 ounce ballpeen hammer marked "Champion De Arment" on the face. The size "6" is marked on the underside of the head, as shown in the lower inset. The overall length is 16.1 inches, and the head measures 1.7x5.3 inches. Fig. 4. Champion De Arment 10 Inch Stillson-Pattern Pipe Wrench, with Insets for Side View and Reverse Detail. Fig. 4 shows a Champion De Arment 10 inch Stillson-pattern pipe wrench, marked with "Champion De Arment" and an anvil logo forged into the shank. The reverse is marked with "Champion De Arment" and "Meadville, PA. U.S.A." forged into the shank, but partially obscured by the jaw carrier assembly (see middle inset). The jaw is also marked with the anvil logo forged into the top, with "Meadville, Penna. U.S.A." partially visible on the shank, and "Champion Dearment" on the reverse (not shown). The overall length is 9.4 inches closed and 10.8 inches full extended. The wooden handle is secured to a tapered tang by a nut on the end. We'll begin with an early example of the Channellock design. Fig. 5. Channellock No. 410 Pliers, with Inset for Reverse Detail, ca. 1932-1934. Fig. 5 shows a pair of Channellock No. 410 pliers, marked "Champion De Arment" and "Meadville, PA." on one handle, with the model number and Channellock logo on the other. The inset shows the "Pat. Appl'd For" notice on the reverse. The overall length is 9.8 inches, and the finish is plain steel. The patent pending status for these pliers suggests a manufacturing date from 1932-1934, between the patent filing and issue dates. Fig. 6. Channellock No. 420 Tongue-and-Groove Pliers, with Insets for Side View and Marking Detail, ca. 1934-1951. Fig. 6 shows a pair of Channellock No. 420 tongue-and-groove pliers of the original patented design, stamped with the Channellock logo and "Reg. U.S. Pat. Off." on the lower handle (but barely visible), with "Champion De Arment" and "Meadville, PA." on the upper handle. The inset in the middle shows a close-up of the patent notice "Pat. In Can. 1933 U.S. Pat. 1950362" on the reverse. The overall length is 10.0 inches when fully extended, and the finish is plain steel. The top inset shows a side view of the pliers, illustrating the simple linear gripping pattern on the handles. The patent notice refers to the original Channellock patent #1,950,362, filed by H.H. Manning in 1932 and issued in 1934. Fig. 7. Channellock No. 407 Pliers, with Insets for Marking Detail and Handle Pattern, ca. 1934-1951. Fig. 7 shows a pair of Channellock No. 407 tongue-and-groove pliers, stamped with the Channellock logo and "Reg. U.S. Pat. Off." on the handle, with "Champion De Arment" and "Meadville, PA." on the reverse. The upper inset shows a close-up of the patent notice "Pat. In Can. 1933 U.S. Pat. 1950362" on the reverse. The overall length is 7.3 inches, and the finish is plain steel. Fig. 8. Channellock No. 427 Pliers, with Inset For Reverse Detail, ca. 1934-1951. Fig. 8 shows a pair of Channellock No. 427 tongue-and-groove pliers, stamped with the Channellock logo and "Reg. U.S. Pat. Off." on the handle, with "Champion De Arment" and "Meadville, PA." on the reverse. The overall length is 7.4 inches, and the finish is plain steel. Fig. 9. Channellock No. 420 Pliers, with Inset for Marking Detail, ca. 1953-1962. Fig. 9 shows a pair of Channellock No. 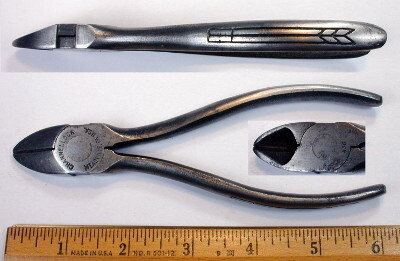 420 tongue-and-groove pliers, marked "Champion De Arment" and "Meadville, PA. U.S.A.", and with the patent notice "US Pats. 2592927 - 2640381" on the reverse. The overall length is 10.2 inches, and the finish is polished steel. The first patent number noted on the pliers is #2,592,927, issued to H.H. Manning in 1952. It describes an improvement to the basic tongue-and-groove design for greater strength, consisting of a flat rib extending outside the machined grooves. The second patent is #2,640,381, issued to H.H. Manning in 1953. This patent describes the use of undercut ridges on tongue-and-groove pliers. Fig. 10. Channellock No. 410 Tongue-and-Groove Pliers, ca. 1953-1962. Fig. 10 shows a pair of Channellock No. 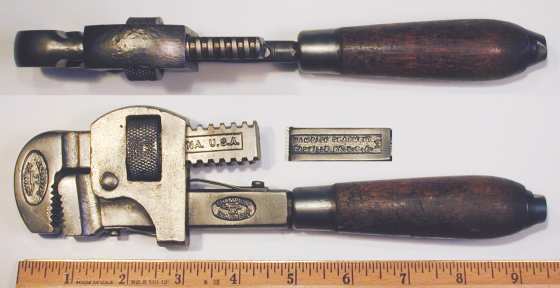 410 tongue-and-groove pliers, stamped "Champion De Arment" and "Meadville, PA." on the upper handle, with the model number and Channellock logo on the lower handle. Fig. 11. Channellock No. 426 Pliers, with Inset for Reverse Detail, ca. 1963+. Fig. 11 shows a pair of Channellock No. 426 tongue-and-groove pliers, marked "Meadville, PA. U.S.A." with the Channellock logo, and with the patent notice "US Pats. 2592927 2640381 Can. 1953" on the reverse. The overall length ranges from 6.6 inches closed to 7.1 inches fully extended. The finish is plain steel. In 1965 H.H. Manning received one additional patent related to the Channellock pliers design, an improved way of machining the undercut ridge. Patent #3,192,805 was filed in 1963. Fig. 12. Channellock No. 420 Tongue-and-Groove Pliers, with Insets for Construction and Marking Detail, ca. 1965+. Fig. 12 shows a later pair of Channellock No. 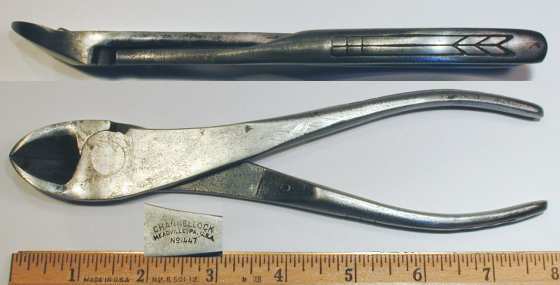 420 tongue-and-groove pliers, stamped with the Channellock name and "Meadville, PA. U.S.A." on the handle, and with "US Pats. 2592927 3192805" stamped on the reverse. The overall length is 10.0 inches, and the finish is polished steel. The first patent number noted is the Manning 1952 patent #2,592,927, describing a ridge extending beyond the grooves for greater strength. The second number is patent #3,192,805, filed by H.H. Manning in 1963 and issued in 1965. This patent describes a machining technique to cut a specific shape for the undercut ridge on the pliers. Channellock later began providing pliers with plastic handgrips in a distinctive blue color, and in 1988 registered "Channellock Blue" as a color trademark, a new concept in trademark protection at the time. Fig. 13. Channellock No. 440 Tongue-and-Groove Pliers, ca. 1980s+. Fig. 13 shows a fairly recent pair of Channellock 440 tongue-and-groove pliers, marked "Meadville, PA U.S.A." and equipped with the familiar blue hand grips. The overall length is 12.0 inches, and the finish is plain steel. Although not marked with a patent number, these pliers are held together by a rivet as described in patent #4,603,607. Fig. 14. Channellock No. 460 Tongue-and-Groove Pliers, ca. 1980s+. Fig. 14 shows another example of recent Channellock production, the Channellock 460 tongue-and-groove pliers, marked "Made in U.S.A." and fitted with blue hand grips. The overall length (fully extended) is 18.1 inches, and the finish is plain steel. The pliers are equipped with eight grooves, and can provide a parallel opening up to 3.8 inches wide. The rivet construction is described by patent #4,603,607. Although best known for their tongue-and-groove pliers, Champion De Arment also produced pliers in conventional designs. Fig. 15. Champion De Arment No. 307 Battery Pliers. Fig. 15 shows a pair of Champion De Arment No. 307 battery pliers, stamped with "Champion De Arment" and "Meadville, PA. U.S.A." on one handle. The overall length is 7.1 inches, and the finish is plain steel. These pliers are described by design patent #D94,156, filed by H.H. Manning in 1933. Fig. 16. Channellock 317-1/2 7.5 Inch Needlenose Pliers, with Insets for Side View and Reverse Detail, ca. 1963+. Fig. 16 shows a pair of Channellock 317-1/2 7.5 inch needlenose pliers with side cutters, stamped with "Channellock" and "Meadville, PA. U.S.A." around the pivot, with the model number on the reverse. The overall length is 7.8 inches, and the finish is plain steel with polished faces. Fig. 17. Channellock 326 6 Inch Needlenose Pliers, with Inset for Side View, ca. 1963+. Fig. 17 shows a pair of Channellock 326 6 inch needlenose pliers with side cutters, marked "Meadville, PA. U.S.A." near the pivot. The overall length is 6.0 inches, and the finish is plain steel with polished faces. Fig. 18A. Channellock 436 6 Inch Diagonal Cutters, with Insets for Side View and Reverse Detail, ca. 1963+. Fig. 18A shows a pair of Channellock 436 6 inch diagonal cutters, stamped "Channellock" and "Meadville, PA. U.S.A." around the pivot, with the model number on the reverse face. The overall length is 6.1 inches, and the finish is plain steel with polished faces. Fig. 18B. Channellock 437 7 Inch Diagonal Cutters, with Insets for Head and Handle Pattern, ca. 1963+. Fig. 18B shows a pair of Channellock 437 7 inch diagonal cutters, stamped "Channellock" and "Meadville, PA. U.S.A." around the pivot, with the model number across the center. The overall length is 7.3 inches, and the finish is plain steel with polished faces. Fig. 19. Channellock 447 Angle-Nose Diagonal Cutters, with Insets for Side View and Marking Detail, ca. 1963+. Fig. 19 shows a pair of Channellock 447 7 inch diagonal cutters with an angled head, stamped "Channellock" and "Meadville, PA. U.S.A." on the reverse. The overall length is 7.7 inches, and the finish is plain steel. Fig. 20. Channellock 3048-1/2 8-1/2 Inch Lineman's Pliers, with Insets for Side View and Reverse Detail, ca. 1963+. Fig. 20 shows a pair of Channellock 3048-1/2 8-1/2 inch lineman's pliers, stamped "Channellock" and "Meadville, PA. U.S.A." around the pivot, and with the model number on the reverse. The overall length is 8.6 inches, and the finish is polished steel. The Champion De Arment catalog No. 556 of 1956 refers to this model as "Bevel Nose Lineman's Pliers". Three sizes were available as models 3046, 3047, and 3048-1/2, with nominal sizes 6, 7, and 8.5 inches respectively. Fig. 21. Channellock 516 6 Inch Combination Pliers, with Inset for Side View, ca. 1963+. Fig. 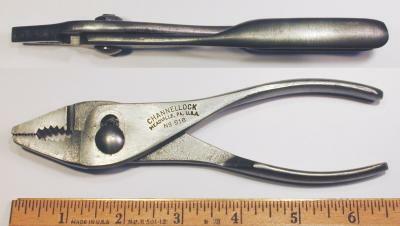 21 shows a pair of Channellock 516 6 inch slip-joint combination pliers, stamped "Channellock" and "Meadville, PA. U.S.A." on the handle. The overall length is 6.4 inches, and the finish is polished steel. Fig. 22. Channellock 548 8 Inch Slip-Joint Combination Pliers, with Inset for Side View, ca. 1963+. Fig. 22 shows a pair of Channellock 548 slip-joint combination pliers, stamped "Channellock" and "Meadville, PA. U.S.A." on the handle. The overall length is 8.2 inches, and the finish is polished steel.